Very simply, I started making hammocks for myself. 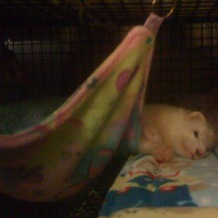 They are basic hammocks made from fleece and sometimes cuddle bubble fabric. 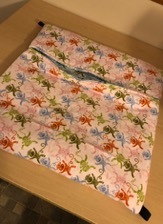 I switched from fabric tabs to gromments since cats were eating the tabs and I was fixing them for customers at cat shows. The padded hammocks are made with cotton or flannel and have a thin layer of batting. These are great for large groups of ferrets and for larger cats. All hammocks are grommeted and come with a set of hooks. You can upgrade from the standard hooks to removable snap hooks for $2 per set. -Fits best in Martin’s Cages barn or other small travel cage. -Fits wire show cages (cat shows) and most cages 18-24” deep. -Fits most cages 18-24” deep. This hammock allows your pet to snuggle inside or lay on top.